Since 2000, MoreSteam has been the leading global provider of online training and Blended Learning technology for Lean Six Sigma and process improvement. Looking to add process improvement to your skill set? There's no more flexible, accessible and affordable way to learn Lean Six Sigma than through online training. MoreSteam offers you four levels of Belt training, five short courses, and specialized courses in Lean and process and product design. If you represent a training program that needs to improve its effectiveness while reducing its costs, we can support you with customizable courses, language and software options, automated testing, and administrative tools. 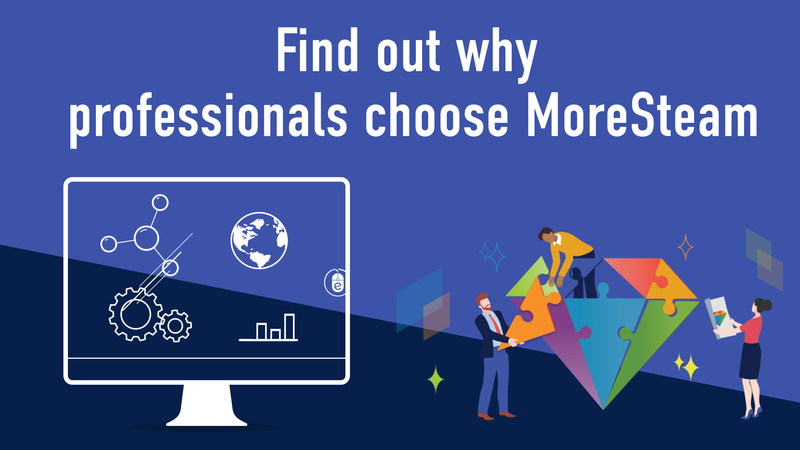 MoreSteam partners with process improvement deployments to provide the exact curriculum that they need to train the entire spectrum of practitioners, from Champions to Master Black Belts. We work closely with you to fulfill your learning requirements and understand your technical needs, such as linking to existing infrastructure and Learning Management Systems (LMS). At MoreSteam, we offer our Green Belt, Black Belt, and Master Black Belt students the option to add certification to their training. Our certification stands apart because it balances knowledge and experience. Our process is practitioner-oriented, requiring you to put your knowledge into practice and to generate real bottom-line results. Our certification home and product pages contain helpful facts, links, and free downloadable resources to assist your certification decisions.